Prepare for the amaal of Laylatul Qadr by understanding the ism Al Ghaffor in connection with the tasbeeh of 'Astaghfirullah'. Part of the night's amaal is to remember the things we have done that have made Allah sad. We have a chance to say sorry and promise to try our best not to do it again. Allah in this month, and especially in these last 10 nights, is extra kind in listening to our duas. Allah is Al Ghafoor. When Allah accepts our forgiveness, He rubs out the wrong actions from the book of deeds that the angels have been writing in. Label an eraser with 'Al Ghaffoor' and prepare the child's notebook with 70 pencil marked Xs. Explain how part of the night's amaal is to recite 70x Astaghfirullaha wa atoobu ilayh'. 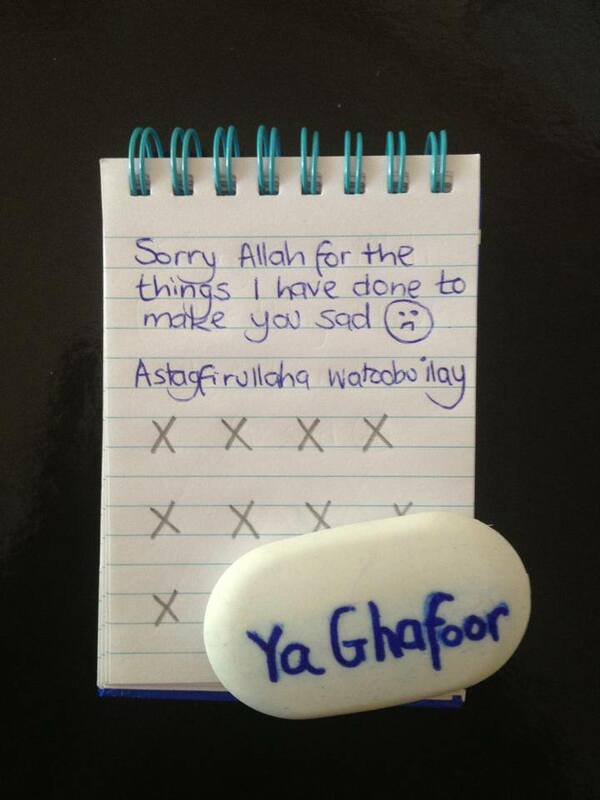 We are saying sorry to Allah for the things we have done that have made Allah sad. Allah is Al Ghafoor, and insha'Allah He will accept our forgiveness. He will rub out the wrong actions from the book of deeds that the angels have been writing in. Symbolise this by having the child rub out each cross after every recitation of Astaghfirullah.